William Leete Stone (20 April 1792 New Paltz, New York – 15 August 1844 Saratoga Springs, New York) was a journalist and historical writer mostly on topics relating to the American Revolutionary War. Soon after the William Morgan tragedy, Stone, who was a Freemason, addressed a series of letters on “Masonry and Anti-Masonry” to John Quincy Adams, who in his retirement at Quincy had taken interest in the anti-Masonic movement. In these letters, which were afterward collected and published (New York, 1832), the author maintained that Masonry should be abandoned, chiefly because it had lost its usefulness. 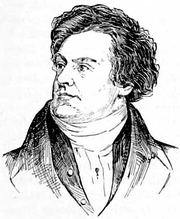 The writer also cleared away the mists of slander that had gathered around the name of De Witt Clinton, and by preserving strict impartiality he secured that credence which no ex parte argument could obtain, however ingenious. William L. Stone is currently considered a "single author." If one or more works are by a distinct, homonymous authors, go ahead and split the author. William L. Stone is composed of 3 names. You can examine and separate out names.